Having explored the coast around Jenner, we also wanted to check out the beautiful Russian River area in-land and so hired a rental house (we felt like spoiling ourselves) in an isolated Redwood grove a few miles outside Guerneville. It was heaven: secluded and peaceful, and with no neighbours for our kids to disturb. As we didn’t know the area at all, the plan was to check out a few parks and get a feel for the area and what there was to do and see for outdoors families. The forests in this area of California are just magnificent and we decided to spend one morning hiking around in them. We chose the Armstrong Redwood State Preserve, partly because the hiking trails looked good for small children, partly because it contains trees which are more than 1400 years old, and partly because the ‘blurb’ said it offered tree hugging platforms and who could turn that offer down? Well, the tree hugging platforms were closed. We had to just hug random trees as best we could. But everything else was as advertised. We chose a short, mile long trail leaving from the parking lot to do with the boys so we could take our time and let them explore the forest floor. If you park outside the park entrance, its free and you can just walk in and pick up the trail. The path was easy for toddlers to manage, although it offered some fallen trees for climbing and interest, and you could probably use a solid jog stroller. We had the boys in our backpacks some of the way, and encouraged the older one to walk as much as he could/would. The park was actually a bigger hit with our nearly 3 year old than I would have imagined. He was fascinated by the sheer size of the trees and by what had caused so many of them to fall over. He also loved running round their large trunks and climbing inside them to investigate. It was also a beautiful and relaxing walk for mommy and daddy. We were, however, grateful we had left early in the morning as the park really started to fill up around noon and some of the special, early morning peace was lost. 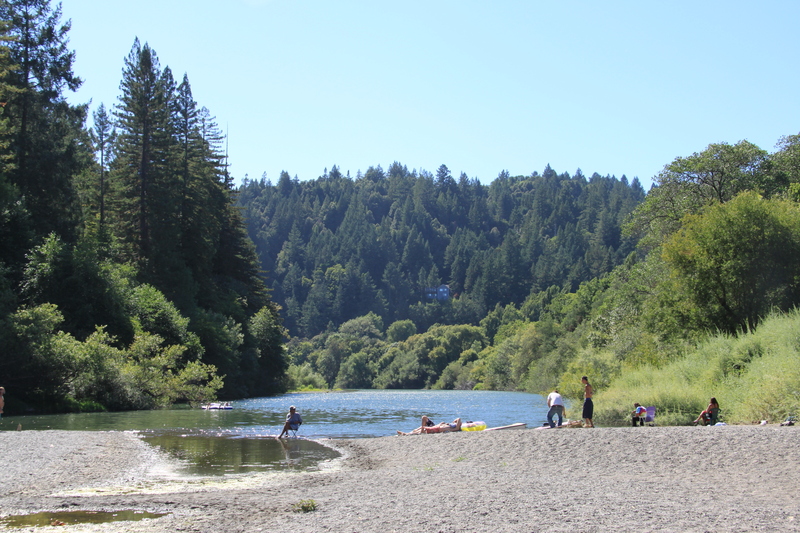 As the day heated up we were drawn to the river and headed into Guerneville to find a paddling spot. Unfortunately, nearly all of the river banks are part of privately owned residential properties and it is, as we discovered, very difficult to get to the water’s edge. Someone had recommended we try Guerneville River Park for a pleasant walk along the river bank. Having checked it out, I’d recommend giving it a miss. It’s a strange little park under the large road bridge that crosses the Russian River at Guerneville and has a real ‘hobo’ feel to it. There even seemed to be someone running a little soup kitchen in the picnic area. The trail itself is very limited and, while one can see the river from the park, there is no access to the water. Most disappointed, we decided to see if there were any other options. 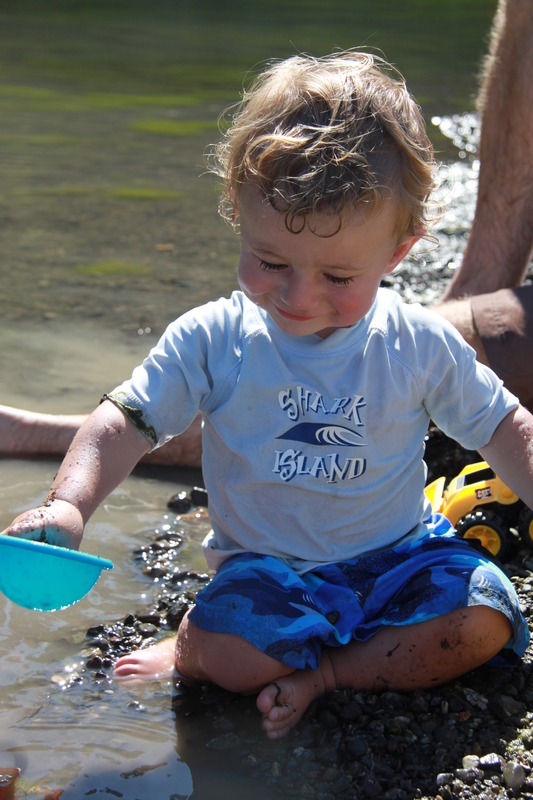 On the other side of the river, just off Guerneville main street, is a commercial riverfront park. Parking and access to the water are free, but there are large beach huts selling food, ice cream, and drink (including alcohol). The ‘beach’ there is stoney and there is no shade, but it is a beautiful spot and you can get down to the water to paddle and swim. It’s probably the best option available. But if you do go, take sunscreen and water. And be mindful of the local “colour” — there were more than a few threatening-looking locals roaming the shore, swearing, fighting, openly drinking spirits and smelling strongly of pot. Our kids were too young to notice, but it might not be the most edifying spectacle for slightly older children. Be warned.